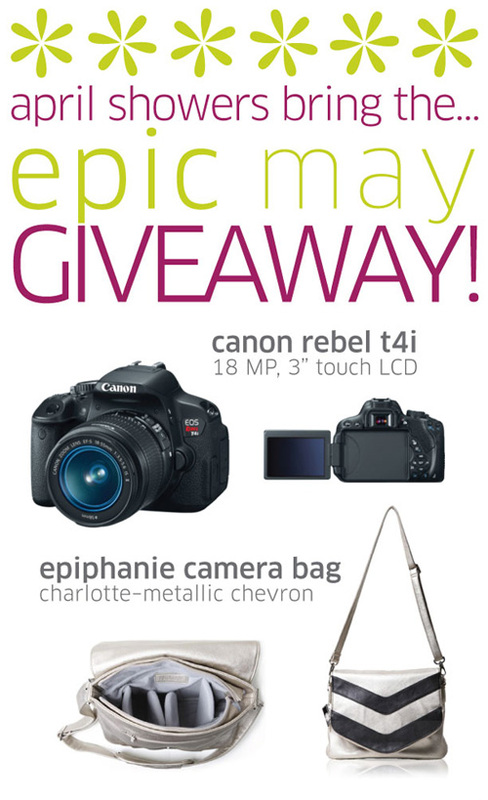 EPIC MAY GIVEAWAY: Canon T4i DSLR Epiphanie Bag | Eat. Blog. Run. We’ve teamed up with some seriously fabulous bloggers to bring you something amazing, you’ll be “running” to enter. See below for how to win a Canon Rebel t4i and a fancy chevron Epiphanie Bag! Sponsored by the ladies of Boston Mamas, Eat Blog Run, Make and Takes, Mom Generations, No Biggie, Petit Elefant, Pinterest You Are Drunk, Rage Against the Minivan, Rookie Moms, The Happiest Home, This Week for Dinner, and Todays Mama. Thank you for giving away these amazing gifts.